Hey everyone, this is a free entry gig on Monday 16th October from 8pm at the Junction Jazz Bar, Brixton/Loughborough Junction in London which is run by local jazz musicians. This night will feature new compositions I’ve been writing for piano trio, and I’ll be joined by the wonderful London-based talents John Turville (piano) and Amy Baldwin (double bass).. They’re both amazing musicians, hope some of you can make it along to join us. Over the past several years, Amy has become an established Bass player on the London scene. 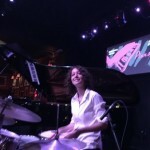 She keeps herself busy by playing a wide variety of music including, jazz, musicals, orchestral work and cabaret shows. She has performed with many of the ‘giants’ of British jazz including Bobby Wellins, Liane Carroll and Kenny Wheeler as well as working with such Internationally acclaimed stars as Imogen Heap and the great George Benson. Drummer Caroline Scott is from Scotland, where she started playing drums. After moving to London in 2008, she has played and recorded in a wide range of musical environments, from theatre shows and jazz big bands, to orchestral percussion sections. She has also lived in Boston where she played with college bands at Harvard, Berklee College of Music, New England Conservatory and MIT, and gigged on the local circuit. She plays with piano trio Cygnus Flare (who this year won the Yamaha Soho Jazz Sessions 2017 competition, played at Ronnie Scott’s and Pizza Express Soho jazz clubs and toured in Armenia), the MO Jazz Orchestra, the Swinging Magpies (vintage swing band), Big Bang Roots (reggae band), and plays timpani in various London orchestras including the Amati Orchestra and BBC Elstree Concert Band. She recently started a masters in jazz at Trinity Laban as an Archers scholar.